I fell going for a jog in the beginning of January and landed on my neck and shoulder area. I was temporarily not able to move my arms or legs for about 5 - 10 seconds. After that I was able to get up and thought I had hit my head. The next morning I realized my head didn't hurt but my shoulders and arms (bicep area) did (had trouble moving my arms due to pain) and my neck was a little sore. I had been moving furniture the day before and went to the gym later that night (night before the fall) and wasn't sure if the shoulder/arm pain was from moving furniture, the fall itself, or landing on my neck. I went to the emergency room where they took MRI and X-rays, put me in cervical collar, gave me pain meds and sent me home the next night. After resting for 6 weeks I have no pain or apparent neurological issues. A few days ago I had some residual slight discomfort in my shoulders and the very top of my left forearm near my bicep but it seems to have gone away. I met with two neurosurgeons the first one wanted to do a C3 - C6 ACFD. The second doctor recommended a C3 - C4 ACFD, saying the other disks were herniated but not as much a problem. He said its good that I have no pain but the C3 - C4 disk is herniated towards the spinal cord. He also said getting the surgery was optional. He was worried that if I were to fall down the stairs or get in a car accident the injury could become worse and I could be paralyzed. He also said even if that didn't happen 10 - 15 years from now the herniated disk could become worse off and possibly cause some damage and then I would have to get the surgery anyway. I was really hoping I wouldn't need surgery considering I have no pain. Does any one have any advice for me being the surgery is optional? My first thought was, will insurance cover it, if the surgery is optional? I'm kinda surprised they're recommending surgery with no pain or neuro issues. I had an ACDF of 3-6 (well, a corpectomy of 5, so a little more invasive), and although I didn't think it was that painful for what they did to me, I certainly wouldn't recommend it as a prophylactic. I had mine because of cervical myelopathy - so it wasn't an option for me. Honestly, I'd probably get another opinion. I was surprised also, I thought they were going to rush me back to work and I was going to ask for a couple days off work without the collar to do some light exercises before returning to work. This is my second opinion and I'm going to a colleague of the second neurosurgeon who's an orthopedic spine surgeon (that would perform the surgery with him) for a third. I'm still learning this stuff and doing some research but I can't seem to find anyone who is getting an ACFD done who has no neurological issues or pain (I did have pain at the time of the fall but it has went away). I'm a little concerned that having the surgery may cause me to have some type of issues that I didn't have before the surgery. This is a screen shot, part of my MRI, I understand that only qualified doctors can read this but just wanted to post. You ain't kidding. I think if you research it a bunch, there's a huge percentage of people that have significant changes on MRI's that aren't symptomatic. I am still very fatigued - and people keep telling me I had major spinal surgery - so what is from my cord compression, and what is because of the stress of surgery? There is someone on here too, that was just checked every 6 months (and know the signs of myelopathy) to monitor her. Good luck in making a decision! I went to see an orthopedic spine surgeon who agreed with my neurosurgeon that I need surgery. He originally wanted to do a C3 - C4 ACDF. 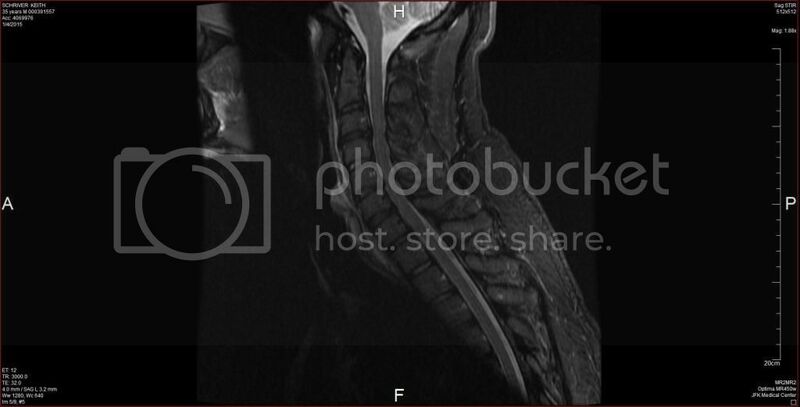 But I asked him about the C5 - C6 area on the MRI as it looked compressed to me on the sagittal image. He said it might be a good idea to do that area also. If he did this he would do a posterior cervical fusion and fuse C3 - C6. 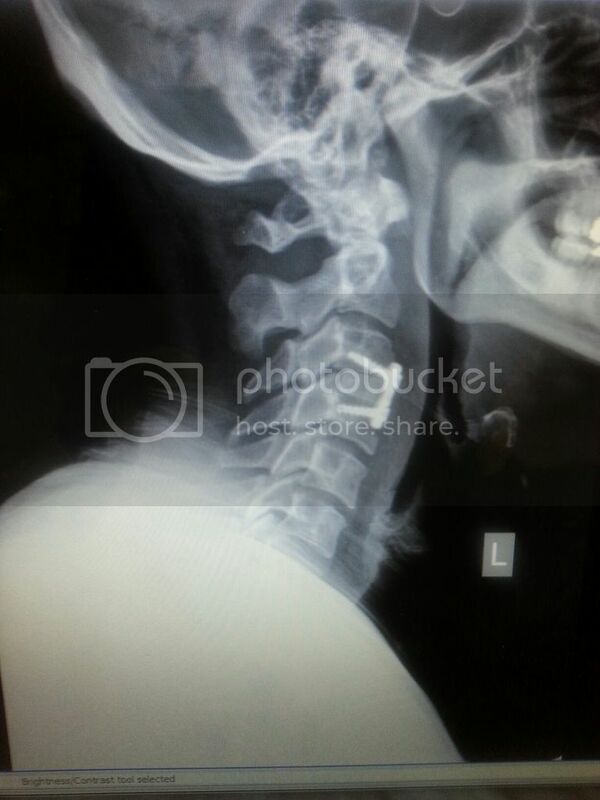 No bone graft would be needed because he would use my own bone in my neck...crushed and sculpted (not sure how this works, I'm having trouble finding info on this)? He ordered me a contrast CT Scan (which I just did) so he could make sure he does only the surgery needed. I go back to see him with the CT Scan Films on Monday. I'm still in no pain and the slight discomfort I had in some areas has completely subsided. My arms and more so my hands however started slightly tingling a few days ago. The orthopedic spine surgeon said I also have hyperreflexia, although I did have a large coffee before I went in to see him so not sure if that made a difference. The good news is that he said I can return to any and all activities I chose once the bones or fused weather he has to do one level or three. This is great news for me because I lift weights, run, and am a fencer. He said I will still be able to do all of these things and take up alligator wrestling if I wish : ) This is great news for me, I was starting to get depressed thinking my sport days were through (big part of mt life), thank god. He did say there is a chance of additional surgery being needed. Three percent per year for up to ten years up to thirty percent, then after that the chance for additional surgery reduces significantly. So sounds like a better chance of not needing it. The only thing I was thinking is that what if I did need additional surgery? Then that surgery required additional surgery, etc? Would my entire spine end up being fused over time? I can understand why he wants to do the posterior- you do have compression on the posterior side. How old are you? Just to warn you, the recovery from posterior surgery is FAR more painful than with the ACDF. If there was a surgeon that did the ACDF, I'd waaaay rather do that. But ask them their reasonings. Look up allograft - most surgeons just use your own bone now, from the spine. They used to do it with the hip bone, and it caused more pain than the neck surgery! I'm a 34 year old male. I like the surgeon's I'm working with as they have done hundreds of these producers successfully. I will ask if it is possible that they could do an ACDF. I'm more concerned with solid a successful surgery then I am with pain, I believe I can deal with temporary pain well. But sounds like I would need more recovery time : ( Ohh okay I see they will take a bone graft from my neck while they are in there and use that. I had my surgery about four weeks ago today. The surgeons decided to do a multilevel fusion after reviewing the MRIs and CT Scan, C3 - C6. After awakening from my surgery I was told they found they only needed to do a single level fusion : ), C3 - C4. I was in the hospital for two days recovering, then sent home with pain pills. I have been resting and am not to drive or do any form of exercise for another two weeks. I also had two follow up visits since the surgery with x-rays and all is well. There is some tingling in my arms and hands which my surgeon expects to go away on its own. Besides the arm/hand tingling I am no longer in pain. The incision area has minimal scaring at only four weeks post surgery. The incision area is numb, under my chin but has been slowly regaining feeling. So, so far my surgery has been a success and I hope to soon return to all of my activities.